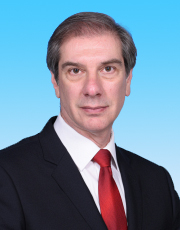 Prior to joining HKUST as the Director of IAS in 2017, Prof Andrew Cohen has been Professor of Physics at Boston University. As a leading expert in the field of theoretical particle physics, Prof Cohen has made seminal contributions to the understanding of the origins of matter and physics at short distances. Among his major research achievements include his groundbreaking work on the construction of models of electroweak symmetry breaking and ideas for the nature and origin of the baryon asymmetry of the universe. He works closely with theorists and experimenters around the world, including those at CERN (European Organization for Nuclear Research) in Geneva, who are carrying out experimental investigations by using the Large Hadron Collider (LHC). The impact of his research achievements is also evident in his impressive publication and citation records. As a prominent figure in the international scientific community, Prof Cohen was elected Fellow of the American Physical Society (APS) in 2003. His leadership in the Aspen Center for Physics, a world-renowned organization fostering advanced research in theoretical physics, has contributed to the vibrancy and success of the Center, where he is currently Chairman of the Board. In this role, he actively interacts with a broad spectrum of internationally renowned physicists to encourage new scientific ideas and bring existing research efforts to a new height. He also served on many US and international boards, including the High Energy Physics Advisory Panel (HEPAP) under the US Department of Energy and National Science Foundation, which has helped lay plans for the future directions of high energy physics in the US. Research achievements and scientific leadership aside, Prof Cohen is an award-winning teacher, and has received unreserved commendations for his inspiring and innovative teaching approach. Acclaimed as a spectacular speaker and excellent teacher, Prof Cohen is passionate about taking science to students and the public. Prof Cohen received his bachelor degrees in Physics and Music, both with distinction, from Stanford University in 1980 and, after spending two years in China teaching English, his PhD in Physics from Harvard University in 1986. He spent the early years of his career at Harvard University as a Postdoctoral Fellow and an elected Junior Fellow in the elite Harvard Society of Fellows. Over the last 27 years of his academic career, he has been with Boston University where he progressed from Assistant Professor to full Professor of Physics.